What is best UK credit card to use abroad? We write a lot on Head for Points about ways to minimise the 2.99% foreign exchange fee added to most credit and debit card transactions outside the UK. For personal travel you might want to get a separate free credit card to use abroad. There are no travel rewards card without a foreign exchange fee. Instead, take a look at cards such as the Virgin Money Travel Credit Card (click here). Whilst it doesn’t earn miles, this card is free and charges NO foreign exchange fees. It also offers 0% interest on purchases for 12 months and 0% interest on balance transfers for 12 months, with no fee. Representative APR 19.9% variable. I also recommend Revolut (the debit card you can load up from a credit card and spend with no FX fees) and Curve Card (no FX fees and your purchases are recharged to any linked Visa or Mastercard). When you are travelling for work, however, your credit card bills will be reimbursed by your employer. There is no incentive for you to get a separate 0% foreign exchange fee card. Your goal should arguably be on maximising rewards for yourself. I won’t focus on credit card spend bonuses here because those don’t change whether you are spending in the UK or abroad. I just want to look at cards which increase your earning rate for FX transactions. American Express Preferred Rewards Gold – double points abroad, so 2 per £1. That translates into 2 Avios or other airline miles, 4 Hilton Honors points, 3 Marriott Bonvoy points or 6 Radisson Rewards points amongst other things. The card is free for the first year. Representative APR 57.6% variable including the annual fee (free in year 1) based on a notional £1,200 credit limit. 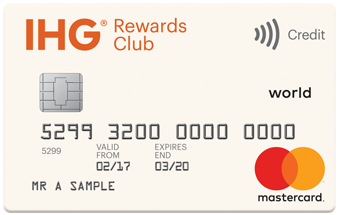 IHG Rewards Club Mastercard – double points abroad, so 2 IHG Rewards Club points per £1 which I value at 0.8p. The card is free. Representative APR 18.9% variable. IHG Rewards Club Premium Mastercard – double points abroad, so 4 IHG Rewards Club points per £1 which I value at 1.6p. £99 annual fee. Representative APR 41.5% variable including fee based on a notional £1200 credit limit. HSBC Premier Mastercard – double points abroad, so 1 Avios or other airline mile. The card is free but you must have a HSBC Premier current account which has strict eligibility criteria. Representative APR 18.9% variable. The World Elite version of this card, with a £195 fee, also earns double points abroad and is worth 2 Avios per £1. As you can see there are some good options here that can get you a return of around 2% on your spending. That is less than the 2.99% foreign fee you are incurring, of course, which is why these are not attractive deals for personal use, just for business expenditure. Interesting topic. What card does Anika use when she’s overseas, and would you ask her to open a 0% FX fees card (Tandem, Curve or Revolut) if she does not already have one? She has a Revolut, I don’t ask her to use it. You should give her a 2.5% bonus on her expenses if she uses a 0FX and you’d both be 0.5% up (well she could be 1% up using a Tandem)! Given that overseas trip expenses are 0.1% of our annual revenue (remember we never pay for hotels etc) I doubt we’ll be wasting mental capacity on that! Rob it’s almost like you have an understanding of how large business works… unlike some of the time wasters on here! It’s when your boss suggests you pay the big dinner bill (even though corporate policy is for most senior person to pay) that you know you’re not exactly going to run into problems with your expenses. I can’t remember ever getting questioned much about my expenses, they just took it on trust, as did I whenever I claimed an expense. You can’t require someone to apply for a card in their own name – that would be entirely unreasonable. Comments are a good read today… For me, given a 2/3% (or whatever it may be) FX charge is pretty much industry standard then I see no issue using a card that does this, regardless of what other cards you have in the wallet. You haven’t taken out a card (certainly for 99% of people) simply to screw your employer, you are using one that you have anyway. If a company isn’t happy with it they are more than welcome to give you a corporate card, which will cost them money and still incur the FX charge. By using your own even with a charge you are saving the company cash vs that option. It amazes me how otherwise well-educated people have such a flimsy grasp of legal definitions. If you added an extra 2.99% to your expenses claim and kept the money, then it would be theft or fraud. But that percentage goes to the credit card company and thus there is no tangible gain for the employee. Any loyalty points earned belong to the issuer so the employer suffers no loss in this respect either. Not to mention the preference for many people, who use a personal Credit Card for work purposes, to keep a particular card exclusively for work. It makes things so much tidier and easier to ensure that expenses claims are settled in full. Comments today are full of opinions! Interesting! Completely off topic but in need of some guidance… I have roughly 8k Emirates points in my account and similar in my other halfs. 3k are due to expire in March – is there anything I can usefully do with them? I’m hoping to book some hotels for the summer but presume it’s not good use of points to transfer from MR or SPG points over to Emirates for hotels…? Very much appreciate some guidance! Transfer to Heathrow Rewards? Arsenal ticket for a rubbish Europa League game? This is probably a revelation to just me, but I just booked a return BA flight originating from Europe and was hit by the FX fee. Had I known this was going to happen, I’d have used the Lloyds Amex which would have actually netted me more points too. I can see this both ways, but I was half-hoping that a UK company would always charge in GBP. Lesson learned, I suppose – if you see another currency quoted, then that’s your clue. BA reimbursed a “duty of care” hotel claim for me in GBP based on the hotel invoice I supplied in euros, and I lost out on the 3% fee that my card charged. What should I have done to get the full amount back? I’d have supplied a copy of the CC bill line too – Amex website has a nice feature to allow you to print a PDF of a single transaction that shows the card fee.